“A goal in our heart” have scored all the players of the International Charity Match that took place at the Athens Olympic Stadium on the 28th of May 2007, with the participation of well-known Greek and foreign players and artists. 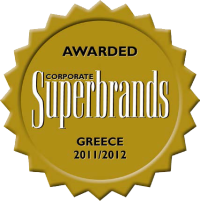 The earnings of the match will be donated to the Charity Organizations “SOS Children’s Village”, “Agios Nikolaos in Cholargos” and “AGAPI of Rethymnon”. The MITERA Paediatrics Clinic was one of the first organizations which participated in this effort and as one of the biggest sponsors of the event, contributed both to its organization and implementation offering among others an ambulance and nursing personnel during the match. The initiative of this effort belongs to the known Greek football player of Sparta Rotterdam Giannis Anastasiou and Father Andreas Kefalogiannis, who mentioned particularly the assistance of the sponsors and especially of the MITERA Paediatrics Clinic, to the point that the president of Aetos of Anogia, Crete made an open invitation to the MITERA Employees’ team for a friendly match in Anogia. 8 known foreign football players (Djordjevic, Filipe, Medunjanin, Kujovic, Stoica, Vaberto, Sinou, Sonkaya) and twelve Greek international football players (Charisteas, Samaras, Gianakopoulos, Machlas, Karagounis, Tavlaridis, Loumpoutis, Dabizas, Kostis, Tsiartas, Konstantinidis and Anastasiou) honoured the match with their presence. The singers Antonis Remos, Nikos Vertis and the actors Giannis Tsimitselis showed their football skills as well, and got an enthusiastic acceptance. The referee of the game was the international Referee Mr Kyros Vassaras, who scored (!!) at the last minute of the meeting. The match “Goal in our Heart” had a full TV coverage and it was broadcasted live by the Greek National Television (NET) and it was watched by 2000 viewers in the stadium. In any case, the winners of the game should be considered the children who were close to their idols taking autographs and their T-shirts after their invasion into the field after the end of the game. The aim of the Paediatrics Clinic is to make the game “Goal in our Hearts” an annual tradition so that it could be able to support an institution and not just an event. The MITERA Employees’ team and the nurses made quite an impression during the match. Filipe, player of La Coruna FC with the winner of Greek Cup from Larissa F. C. Nikos Dabizas. 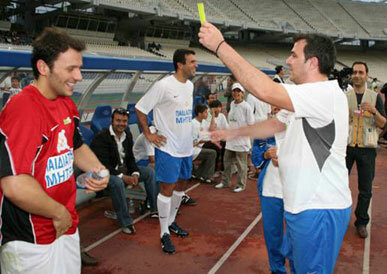 Antonis Remos gives a yellow card to Nikos Vertis while Giannis Anastasiou smiles behind them. Giannis Tsimitselis with some of his funs. Children, the real winners of this charity match. Here with N. Dabizas, P. Djordjevic and the Sports deputy minister Mr. G. Orfanos.